“It’s About The People!” is a culmination of four musicians with vastly different backgrounds who share a common goal, to create authentic music. The band’s sound draws heavy from an impromptu take on American roots music but is not bound to any one specific genre. 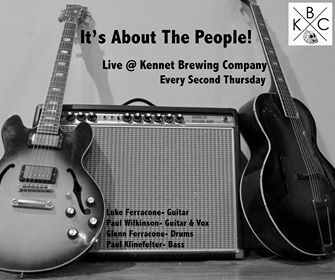 IATP will be playing at the always-phenomenal Kennett Brewing Company every second Thursday of the month. Different guest musicians will be often featured and share the stage with the line up of Paul, Luke, Glenn and Paul. Come out and hang at KBC, drink beer, eat food, dance, and enjoy the music; it’s about the people!